Le Roi was thoroughly spoiled at the weekend by his visitors from Switzerland and is still basking from the glow of the wonderful time that he had. There were gifts, there were cuddles, there were endless photographs, and somehow, through the toys he was given, he seems to have rediscovered his joie de vivre. He is truly a pleasure to be around at the moment (apart from at 4am this morning, when I wanted to strangle him). He seems to be spending more time in the garden here than he ever did at Le Palais. I’m not sure whether it’s liking the feel of the extra soil under his little feet, or the fact that he has encountered zero other cats so he feels like the true Roi du Château, but he is often out there, just sitting in the flowerbed and watching butterflies and bugs go by. If you have a cat and you also have some of these plants, don’t panic: apparently they only really pose a problem if your cat is stupid enough to roll in them or chew them. Unfortunately, ours is. The most easily identifiable was the hydrangea (the pink one to the right of the photo), to which, naturellement, Louis Catorze is irresistibly drawn; he has even been known to shelter under it during storms. (Most cats would just come indoors, but ours is a bit different.) Luckily that was easy to remedy as the plant is in a pot, so it was moved to The Front where Louis Catorze isn’t allowed to go. We have quite a few euphorbia dotted around, which will go as soon as my mum is able to come over and dig them up for her own garden. We don’t really know enough about plants to know whether we have anything else that’s on the list, so I guess that will be a super-long-term work in progress, especially as new things spring up as the seasons change and we have no idea what’s going to appear over the next year or so. 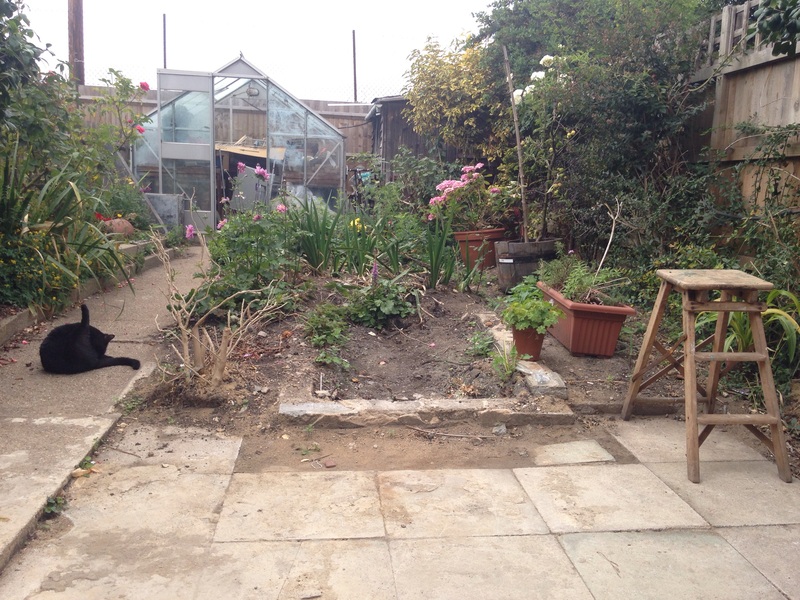 If you are a gardener and you think you can spot any offenders in my photo, please let me know. < Previous Bienvenue à mon château! Next > Je suis en bonne santé! Nice of him to tend to the tongue ablutions outside and nearly out of site so that you don’t have to declaim “Where’s the mystery!” when attending to such indoors and on your lap or on your bed. He does seem quite at home in his realm.